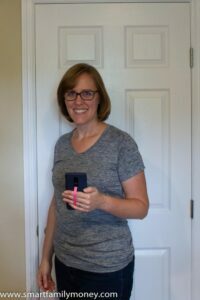 Have you been looking for something to help you hold on to your phone? Have you been shocked by the prices of Popsockets, LoopyCases, or other popular phone grip accessories? Me too! My kids and I enjoy playing Pokemon Go. We go for long walks around the park with our phones and phone drops are a frequent problem. I wanted something to help that didn’t cost $8-30 per phone. 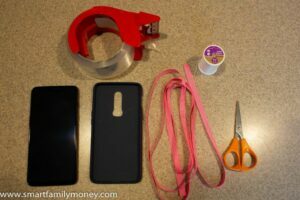 There had to be a cheaper alternative to Popsockets and LoopyCases! I came up with a DIY solution that only requires about 5 cents worth of materials. How’s that for savings?! 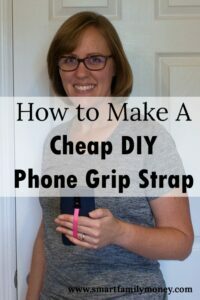 In this post, I’ll show you how to make your own cheap DIY phone grip strap. Have a modern smaller phone that’s hard to hold onto. Have your hands full already (with groceries, drinks, papers, etc). Run or walk with your phone. Have a large tablet-style phone that you can’t get your hands around. Enjoy playing Pokemon Go while walking for an extended time. Have a child who drops your phone because of lack of coordination. Have physical limitations due to age or disability that limit your ability to hold a phone. Want to use your phone one-handed, such as while holding a handrail on a bus or train. Doesn’t interfere with wireless charging. Works with magnetic car mounts. Doesn’t add any thickness and lays flat. Can be used with a single finger as a handle when your hands are full. Can be used with any phone while LoopyCases are only available for Apple, Samsung, and Pixel. Works with any type of phone case. Doesn’t function as a stand. It helps with grip only. Can break with heavy use (but is easy and cheap to replace). Doesn’t hold quite as tightly as some elastic grip options. Phone case: any variety should work. Mine is a basic TPU case. Ribbon: non-stretchy and not too slippery. I used this pack of 3/8″ grosgrain ribbon. Insert one end of the ribbon through the charging hole in the bottom of the case. Insert the other end of the ribbon through the camera hole in the middle of the case. 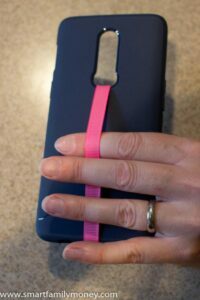 Wrap the ribbon around the back of the case and cut a piece that overlaps by 1-2 inches (as shown below). 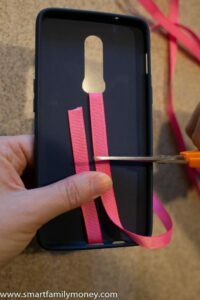 Hold the ends of the ribbon on the inside of the case, as in step 1. 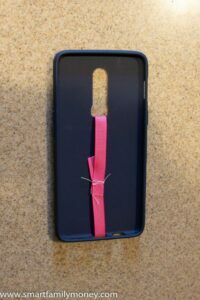 Put 1 or 2 fingers underneath the ribbon on the outside of the case to estimate how much slack you need. TIP: Do not pull the ribbon tight when you attach it or you won’t be able to get your fingers inside. TIP: You may need to adjust and experiment with the tightness to find what’s comfortable for you. Estimate how much slack you need in the ribbon to fit your fingers. 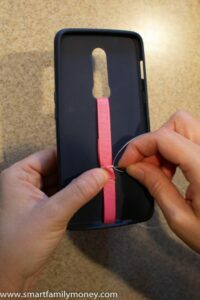 Leaving the ribbon as loose as step 2, firmly tape the ribbon to the inside of the case. Rub all around the tape to make sure it’s gripping well. TIP: Do not overlap the ribbon if you’re taping it. It will hold better if it’s not overlapping. TIP: The tape must be very strong. I recommend Scotch Heavy Duty Packing Tape. Be sure to push down the tape firmly. The tape will eventually let go, so sewing is a sturdier, longterm option. Using the amount of slack you measured in step 2, sew the ribbon into a loop. Any type of stitch will work, as long as you make a few tight stitches. Sew the two ends of the ribbon together. It’s OK if your stitches are sloppy! No one will see them inside the case. Put your case back onto your phone. Test that the ribbon is holding tightly. Adjust as necessary. Go for a walk with your new phone grip strap!